Looking for the right tee to match your new pair of True Blue III’s? This might be perfect. The bandana portion is even made up entirely of a cement pattern. Grab it right here for $30.00. I had to search a handful of sites that still had stock so jump on that link asap. You’re welcome. So I was just browsing around and stopped by the Crooks & Castles shop blog. Seems like they wisely chose to use the same WordPress template as good ol’ Bigsteez. Anyways just picked up the Flying Gun Tee in all over print on white for 20 bucks at the mall. Yeah I hate the mall too but MetroPark has Crooks on clearance cuz the Abercrombies don’t buy them. 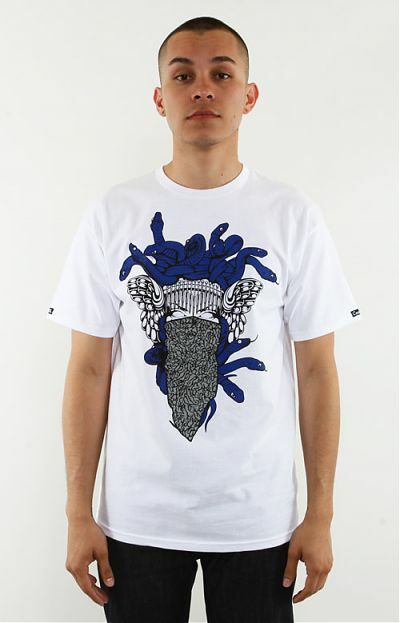 Found this collaboration tee browsing the new arrivals over at Become Fitted. You don’t see a shirt with two different clothing companies’ logos too often. I guess this is one exception. Dissizit and Crooks and Castles teamed up to design this medusa-ish “snake eyes” print covering the majority of the front. On each sleeve is the Dissizit “D” inside the Crooks “c-chain.” The back also features more Dissizit x Crooks art. Crooks and Castles are now finally available… well, yeah available. My prior attempts to locate this brand online led me to a bunch on online clothing retailers that were sold out of every shirt except Small sizes. Now they are widely available via Karmaloop.com. Check out their product page for an extensive collection of in stock products but hurry as they are pretty notorious for moving fast. Pictured above is the “Gods & Insects Tee” in 2 colorways. Click the pic. Holla.